Supreme Styles, Hip Hop / Rap / RnB Sample from Ueberschall. 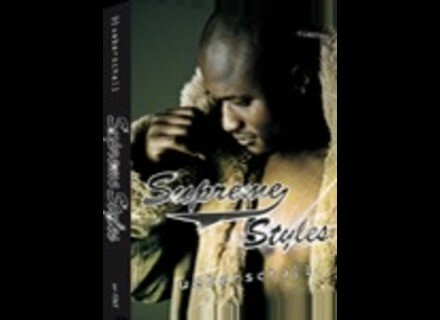 Supreme Styles is a library of urban music focusing on guitars for a range of styles such as HipHop, R&B, Club and Dancehall, as well as other surrounding genres. Each of the 30 Construction Kits delivers a composed track, (including a main part, variation, intro/outro), which consist besides its instrument and drum and percussion loops, of several guitar loops. With a range of 58 bpm to 127 bpm, you‘ll find unique tracks, which have their own tension, feeling and style. The 4GB package has more than 1600 loops and samples. Since the main focus of this library was set on guitars, there is a range of acoustic and amped guitars, such as rock guitars with and without distortion, flamenco guitars, classical nylon guitars, also guitars with wah-wah effect and more. All guitar loops were created with top brands such as Fender, Gibson, Music Man, PRS, Sandberg, Martin, Washburn and Takamine, to name a few. Amps used include Marshall, Vox, Mesa Boogie, Hiwatt, Engl, Orange, Line 6 and others. Additional DSP processing, stomp pedals, along with outboard processing were also applied. Main Kit - Includes the main theme, with its sounds and phrases. Variation Kit A - Provides an alternative track and phrases which is used to add contrast to the main theme and gives you more flexibility for your entire track. Intro/Outro Kit - Here you can find the matching intro/outro track for the overall kit, along with its individual parts. Single Drum Sound - The single-shots are centralized in this folder, making it easy to create your own additional drum patterns. Rob Papen Updates Predator Rob Papen has updated the Windows version of Predator to v1.5.8. Togu Audio Line Windows 64-bit Versions Togu Audio Line has released Windows 64-bit versions of many of its free plug-ins. Freak Show Enterprises JambaLaya Freak Show Enterprises has updated JambaLaya to v1.3.1.